Inspired by World War II Submariners’ Sweaters I have created my Cruel Sea Cowl. This is a 2 by 2 rib knitted in the round on 60 cm, 5 mm circular needles. I used 100g of Aran weight Toft Alpaca in Oatmeal. It is designed to be close fitting so you will need to use an extra stretchy cast off and you will need to swatch, maybe even swatch in the round as you may have a different tension in the round to working flat. The key is to make sure that you cast on enough stitches to fit over your head. My head circumference is 22 inches/56 centimetres. I cast on 76 stitches and the finished cowl is about 22 inches/56 centimetres round and 8 inches/20 centimetres tall. When you cast on remember the 2 by 2 rib pattern needs to be in multiples of 4 stitches. Step 1 – Cast on 76 stitches, plus an additional stitch. 77 stitches. 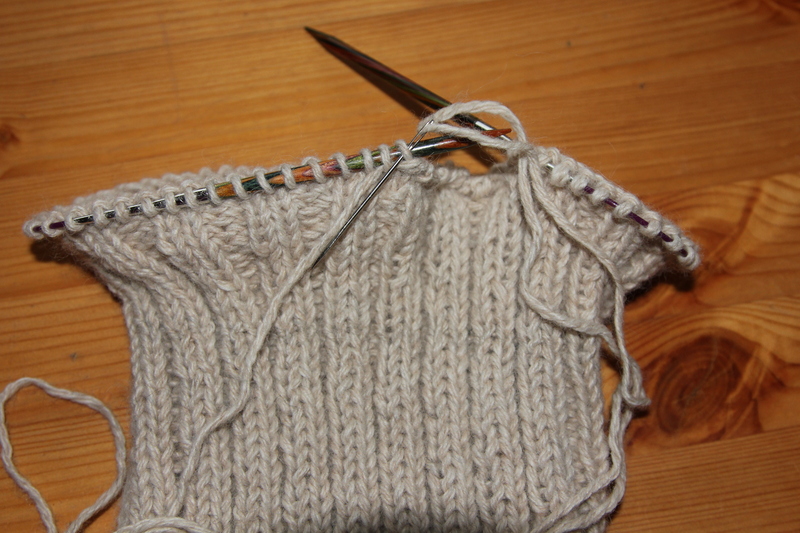 Step 2 – Knit 76 stitches. Knit the 77th stitch together with the first stitch. 76 stitches in the round. From now on work in the round. Step 3 – Starting with knit stitches begin the 2 by 2 rib i.e. knit 2 purl 2. Step 4 – Work until your cowl is the height that you desire, my cowl is 8 inches tall, approximately 43 rounds. Ensure that you have plenty of yarn left for your stretchy cast off , I allowed 3.5 metres. Step 5 – Cast of in as stretchy a manner as you know how. I used a tapestry needle and a method similar to this sewn bind-off. Next Post What a difference a dye makes!